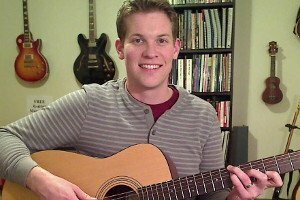 Looking for a fantastic Skype guitar teacher to take your playing to the next level? Get started right now! Hi! My name is Joe Walker. I’ve been playing guitar since 1998 and teaching full-time since 2011. I grew up in the Seattle area and picked up the guitar in high school because I thought it would make me cool. If it worked at all, I’m now just hoping it will help me remain cool. In the years since, I’ve studied, performed, and taught guitar lessons in a wide range of styles. I create lots of articles and videos on this site as well as From the Woodshed, a practice journal chronicling my own study of music and guitar. The obvious advantage to Skype guitar lessons is that you can learn guitar from a real person without leaving home. Many of my Skype students live in parts of the world that make it inconvenient to commute to an in-person lesson. You also have a wider selection of guitar instructors to choose from; online lessons are exploding in popularity, and there’s a global market of great players offering Skype guitar lessons, each with unique skills and insights. Get a feel for my teaching style with my free video lessons on YouTube. I also teach ukulele and bass. If you’re ready to sign up, or you have a few questions before you commit, get in touch with me through the Contact page, and we can get the ball rolling.